More than 70 years after he served in World War II, a Eugene-area veteran, former spy, and retired English professor has received Congressional recognition. 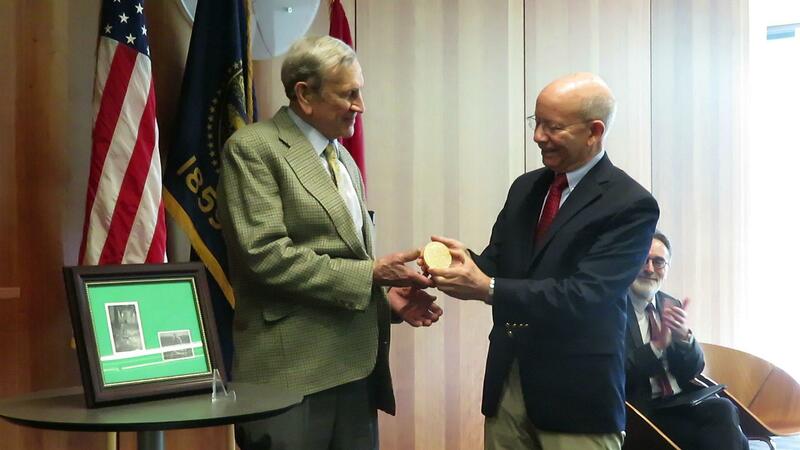 George Wickes (left) receives his Congressional Gold Medal from U.S. Representative Peter DeFazio (right) at today's ceremony at the Wayne Morse Federal Courthouse. At the Wayne Morse Federal Courthouse, 96-year-old George Wickes stood before several dozen people as Oregon Congressman Peter DeFazio presented him with a medallion. Wickes' medal is stamped "OSS", which stands for The Office of Strategic Service, which he served with in French-occupied Vietnam in the 1940s as a spy. Wickes was honored for his time with the Army, and the Office of Strategic Service, the predecessor to the CIA. Wickes was a cryptographer in French-occupied Vietnam from 1943 to 1946. He says an American military intelligence unit was a fairly new concept. George Wickes, during his remarks before an audience of roughly 50 people at today's ceremony. During his Vietnam term, Wickes’ commanding officer was killed, and he got involved in a firefight with guerrillas. He also interviewed independence leader Ho Chi Minh. Filmmakers Ken Burns and Lynn Novick interviewed a retired University of Oregon English Professor about his time as a spy following World War II for their documentary The Vietnam War. The series wrapped up Thursday on public television. On the heels of his party’s reclamation of the House of Representatives, Oregon Democrat Peter DeFazio is firing up his transportation agenda. KLCC’s Brian Bull reports.